Preheat the oven to 220°C, gas mark 7. Place 50g of the sugar and the cinnamon stick in a medium sized saucepan with 150ml water. Gently heat until the sugar dissolves. Add the plums to the pan, bring to the boil, then simmer for 5 minutes, or until the plums have softened. Remove from the heat and stir in the frozen raspberries. Leave to stand for 5 minutes, then remove the cinnamon stick. Divide the crushed biscuits among 6x200ml ramekins, and then spoon the stewed fruits over. In a clean, dry bowl, whisk the egg whites to a stiff peak. Gradually whisk in the remaining sugar, until you have a stiff, glossy meringue. Heap some meringue onto the top of each ramekin. Place the ramekins on a baking sheet and cook in the oven for 5 minutes, or until the meringues are golden but still soft inside. Serve immediately. You can swap the plums or raspberries with rhubarb and apple, or try some of our frozen fruit range, such as Waitrose British Garden Fruit Mix or Waitrose Black Forest Fruits, a great value and convenient way of cooking with non-seasonal fruit. 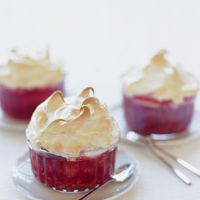 The fruit can be cooked in advance, cooled and spooned into the ramekins, then topped with meringue when ready. One of your five a day. 0.1g salt per pot.